There are two places you simply must visit when you are in Asheville, North Carolina: Biltmore House and Gardens and Rhubarb, a restaurant in the heart of downtown. Owner and Executive Chef John Fleer is a five-time James Beard nominee for Best Chef Southeast and diners will love his creative dishes with their origins in the farms around the city. Location: 7 SW Pack Square in downtown Asheville, , directly across from the Pack Memorial. Menu: The menu at Rhubarb is ever-changing to reflect the seasonal offerings of area growers, but you will always find Snacks, Appetizers, Shareables, Full Plates with a meat, fowl or fish main course and vegetarian options called E.Y.V. (Eat Your Vegetables). Diners may also choose from a selection of cheeses made in North Carolina and oysters from locations varying according to availability. Snacks are likely to run the gamut from rosemary and sea salt pecans to a plate of house-pickled vegetables. 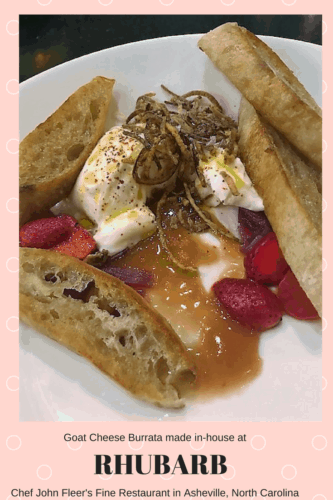 The NS Goat Cheese Burrata, made in-house, is not to be missed. The rhubarb jam, pickled strawberries, and crispy shallots put the flavor over the top. Duck, grouper, trout, pork loin, chicken, and steak were offered on a recent menu, along with collard greens, asparagus, broccoli and a smoked mushroom cassoulet. Craft cocktails, beer on tap, beer in bottles, whiskey, rum, brandy and an impressive list of wines by the glass are available, but the selection of hot teas is especially appealing with varieties such as Chamomile Lavender, Asheville Grey, Rwandan Black Orthodox, Silver Needle and Mountain Mint. Dessert choices are extraordinary. Recent items included a lemon parfait, a lime and coconut cake with brown butter ice cream, and seasonal frozen scoops of Thai chocolate, popcorn ice cream and strawberry-rhubarb sorbet. Thoughts: If you are at all interested in watching the action of the culinary staff, I strongly recommend requesting a seat at the Chef’s Table. You will observe highly-skilled people working their magic with ingredients, seasonings, knives, pans, open flames and ovens. Chef Fleer supervises carefully and inspects every dish before it is served, tweaking and rejecting if he feels it is not up to his high standards. Each member of the team has a specific area of responsibility, and the action reminded me of a well-tuned orchestra performing a symphony. Pastry Chef Kaley Laird is a wonder in her position and a valuable asset to Rhubarb. When describing a seasonal dessert creation called Dreams of Summer, she shared: “The Dreams of Summer dessert is a fun play on S’mores as my current menu is focused towards childhood nostalgia of summer. If you want to break it down, it contains all of the components of a S’more right down to the smoking campfire. Marshmallow is there in two forms, in the panna cotta and in the toasted marshmallow ice cream. The smoke and woodsy aspects are hidden in all other components. I used a lot of sage and rosemary to hint at the pine and earthy scents of camping and imparted smoke into the chocolate and caramel for the fire aspect. The dessert itself contains a lot of different components but the base is a Marshmallow Panna Cotta, Smoked Sage Ganache, Graham Cracker Honey Crisp, Smoked Caramel, Toasted Marshmallow Ice Cream and Burnt Sage Ice Cream.” I would say that her imagination led to an amazing result and was probably the most unusual dessert I’ve ever tasted. Chef Kaley went on to say that her specialty is desserts that aren’t too sweet. I think she’s got the right idea. The atmosphere at Rhubarb is intimate and cozy with a modern decor incorporating vintage materials and colors. Reservations are recommended but not required. Price Range: Snacks are $5.50-$7.00. A selection of cheeses are 3 for $12 or 5 for $18. Oysters are 3 for $9, 6 for $17 or a dozen for $30. Appetizers are $10.50 to $13.50. Shareables are $14 for a salad to $47 for a whole wood-roasted snapper for two. Full plates are $27-$32, and vegetable choices are $6.50 for broccoli and collard greens up to $19 for the smoked mushroom cassoulet. Desserts are $8 each, but the scoops of ice creams and sorbets are only $6.